* All garbage must be inside the toter with the lid closed for collection. Extra garbage outside of toter will not be picked up, except after major holidays. (863) 421-3777 discuss the purchase of an additional toter. *Yard waste consists of grass clippings. branches, palm fronds, and other vegetation trimmings All yard waste must be bundled or bagged. Do not place yard waste in your garbage toter. * Do not mix yard waste with bulk items. * The monthly charge for residential customers is added to your water bill. 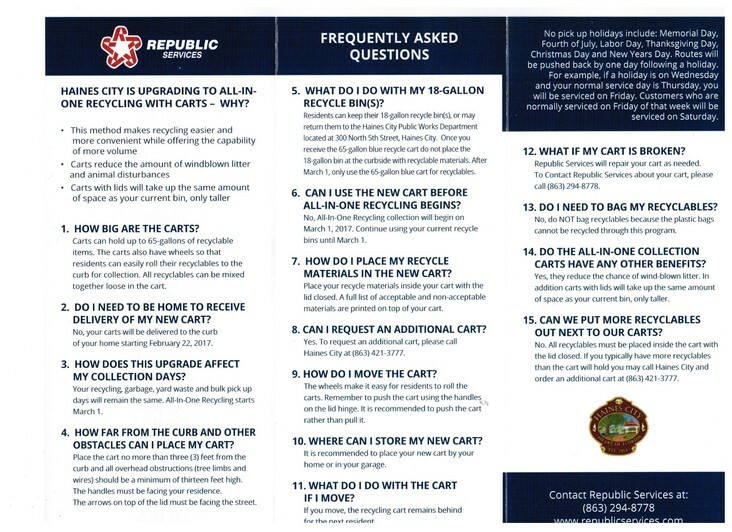 * A garbage toter and recycling bin will be delivered to each new property at no charge. A flyer explaining the service and schedules will be placed in each container. * If a garbage toter is not at the property (to which you move), a toter must be purchased. Garbage and Recycling is picked up once a week on FRIDAY. Garbage and Recycling must be placed at curbside prior to 6:00am on the day of service and removed by midnight the same day. Residents are to place their garbage and recycling containers to the curb no earlier than twelve (12) hours prior to 6:00 am of the scheduled day of collection. Place the toter 5 feet from mailboxes, vehicles and all other stationary objects. If your refuse or recycle is not at curbside by 6:00am and the collection vehicle has already been in the area, collection will not be until your next scheduled collection day. The containers shall be removed from the curbside and returned to a point at the side yard, except where a side yard abuts a right of way, or rear of the residence, not later than 12:01am (midnight) of the day of collection. Any containers not removed will be tagged by the city with a twenty-four hour warning. will result in a $25 charge being placed on the customers utility bill for each violation. Each incident and 24 hour period that the container is not removed or out of schedule shall be considered a separate offense which shall result in an additional $25 per offense, the charge being placed on the utility bill. Additional containers are available for purchase for those residents requiring additional containers for $80.00 tax included and can be added to your water bill in six monthly installments. Commonly accepted recyclables for your home include: cleaned and rinsed aluminum and metal cans, plastic containers (#1 through #7) and clear or colored glass (not broken). All paper & paperboard products, including newspapers, magazines, telephone books, junk mail, office paper, flattened boxes, etc., except food contaminated or wax coated paper, (flattened boxes should not exceed 3 ft x 3 ft in size). Place all your recycle materials inside the cart with the lid closed. Do not place any overflow outside the 65 gallon container. Break down your boxes to help with additional space in the cart. Do not bag recyclables because the plastic bags cannot be recycled through this program. Take plastic bags to your local grocery store for recycling. 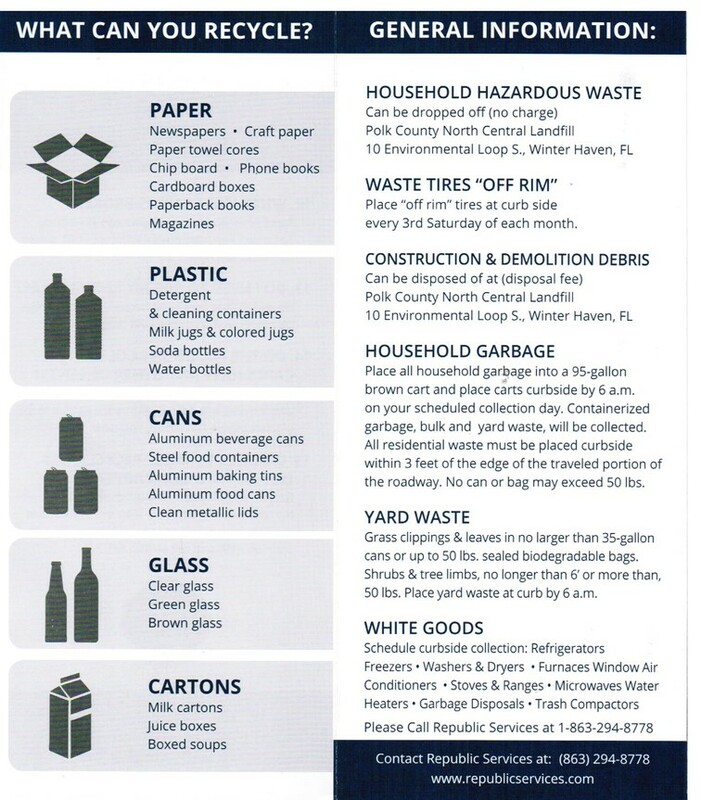 Recycling services for residents is a once a week program; utilizing the provided 65-gallon plastic recycle container. Additional containers are available for purchase for those residents requiring additional containers for $80.00 tax included and can be added to your water bill in six monthly installments.